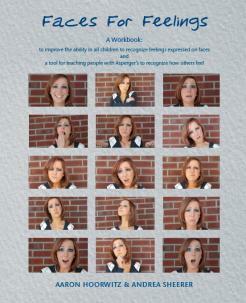 The purpose of this book is to improve the ability to recognize the feelings expressed on the faces of others. Although most children learn to do this on their own, the ability can be improved with practice. Practice is provided here by exercising certain intellectual skills that contribute to the development of intelligence. The book requires the child to exercise these skills in an active way on each page, in contrast to the passive way of listening that is typical for most children’s books. The reason that this book is a teaching-tool for people with Asperger’s Disorder is that they usually can’t tell what others feel from seeing the expressions on their faces. It is because they are “mindblind,” which means that they are blind to the minds of others like a “colorblind” person is blind to certain colors. This idea of “mindblindness” can help us to understand behavior that is misunderstood most of the time. Since the expression on a person’s face is an important social cue, blindness to this social cue impairs the ability to make friends. It can make the “mindblind” person seem odd to others when he misinterprets the feelings of others by punching a girl who is only flirting when she playfully pokes him with a finger. He needs extra practice at recognizing what others feel, practice that he can get in this book in a way that is easy enough for him to feel successful.